April 27, 2015: Chopper 5 flies over the Johnson County town of Rio Vista where several tornadoes were reported Sunday, April 26, 2015. Severe thunderstorms April 26 spawned 15 tornadoes, the National Weather Service confirmed Monday. Initial reports from Sunday's massive storm included 18 reported tornadoes. NWS crews would later confirm only 11 that were all rated EF-0 with wind speeds up to 85 mph. On Monday, more tornadoes were confirmed, all near Rio Vista. 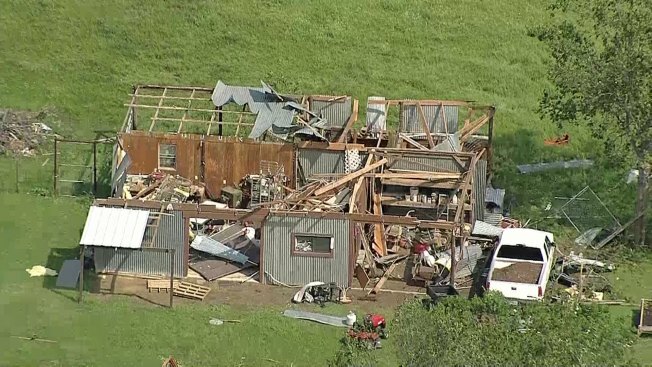 NWS said eight tornadoes touched down in or near Rio Vista, where the main supercell thunderstorm was located for several hours. Two of the tornadoes are EF-0 and one EF-1 with top wind speeds of 90 mph. Below is information published by the National Weather Service on each of the 11 tornadoes. 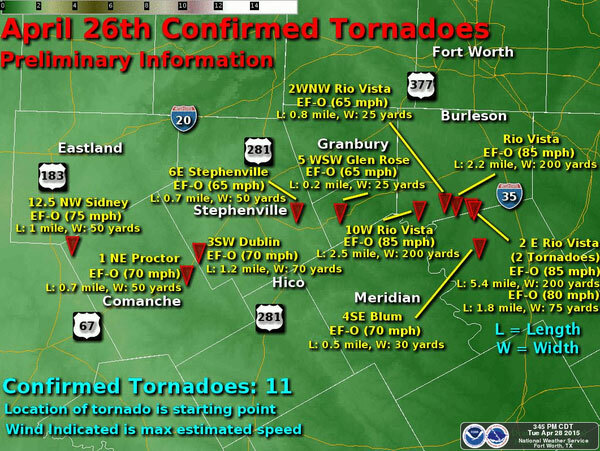 A map created by the National Weather Service shows the location of 11 confirmed tornadoes that touched down in North Texas on April 26, 2015. Survey_summary: This tornado appeared to rotate counterclockwise within a much larger — approximately 1.5 mile width — circulation within the rotating updraft of the parent supercell thunderstorm. The path took a nearly horseshoe shape track as it looped in a counterclockwise direction east of Rio Vista. Survey_summary: Radar and damage survey evidence suggests that this was a clockwise rotating tornado.